Packed out: Unidene by Andrew de Boer safe in an open crate. The collection at the Sarjeant Gallery Te Whare o Rehua Whanganui consists of artworks executed in all manner of mediums. From paintings and drawings to photographs and ceramics there is something for everyone. 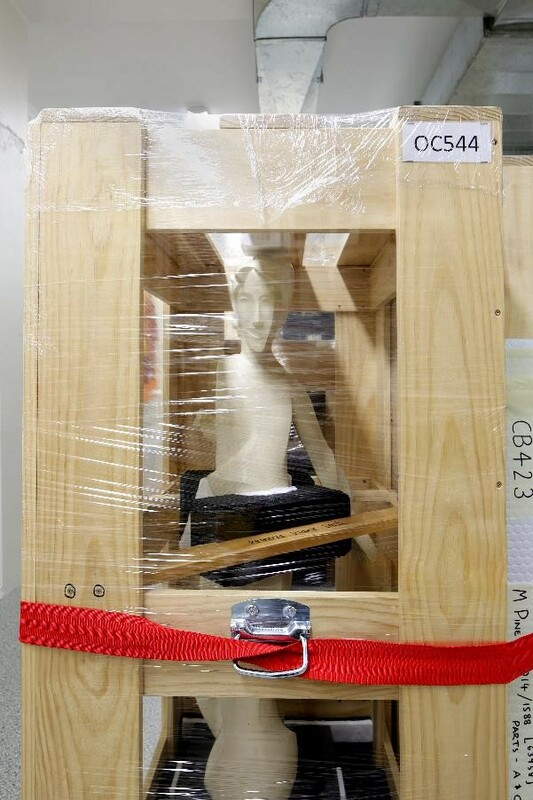 With every type of artwork in the collection comes a different way of handling and packing for transport. For paintings we had timber travel frames custom built to ensure the work would be secure for transport. Ceramics were safely packed into cardboard and plastic boxes. Our larger sculptural works required yet another form of packaging. Because of their large size and sometimes awkward shape these objects couldn’t be moved in plastic boxes or travel frames. For these works we had large open crates custom built to our specification. 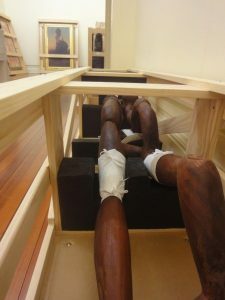 The open crates, essentially a wooden box with no sides, were built by Palmerston North based company, Manawatu Museum Services Ltd. The team are very supportive of the Sarjeant’s redevelopment project and have been on hand during the transition to Sarjeant on the Quay. The crates were built in an ‘open’ style which meant less materials were needed than that of a standard crate with built in sides. Less materials kept the cost down and also made lifting and moving the crates much easier. Once the crates were built it was up to my colleagues and I to safely place the object inside and pack it out to ensure the work had enough support to be safely moved. Packing out an open crate requires three layers of packing. The first layer is a thick dense foam called ethafoam. The ethafoam provides a dense base to support the object. Next a layer of synthetic wadding, Dacron, is placed over the ethafoam to provide padding. Finally a layer of durable waterproof synthetic fabric called Tyvek is added. The Tyvek acts as a nice smooth barrier between the foam and the object eliminating possible abrasions to the object. After the object is safely secured, packing instructions are clearly printed on the crate and it is wrapped in shrink wrap. 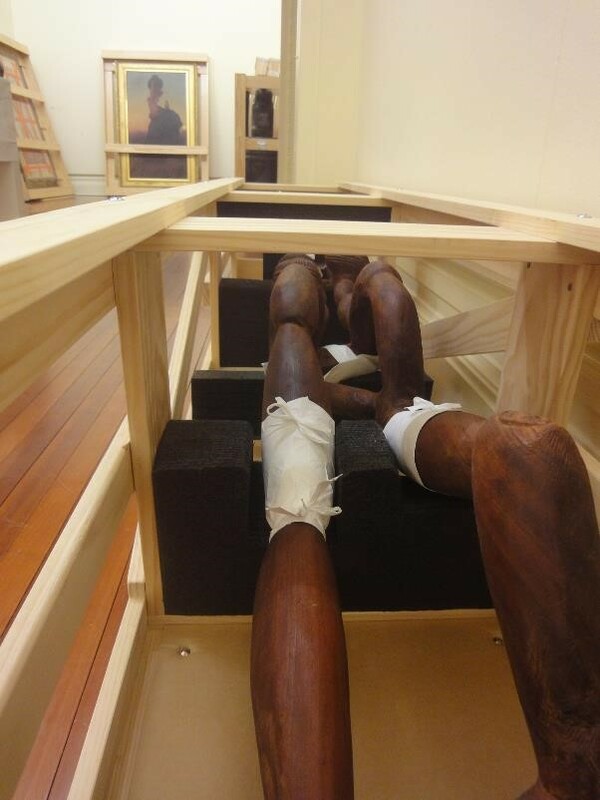 Shrink wrap creates a micro-climate in the crate which decreases the risk of shock to the object during its transition from the fluctuating climate at Queen’s Park to the controlled climate at Sarjeant on the Quay. 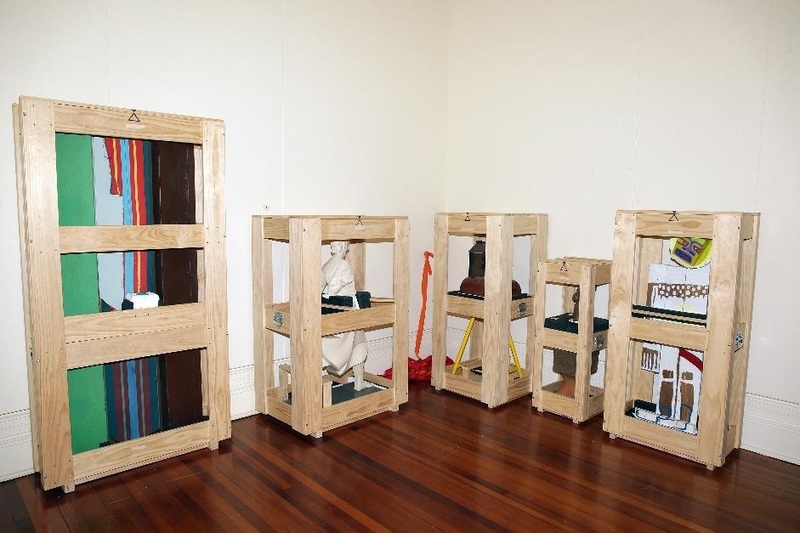 The open crate is not only a safe means of transporting sculptural objects but can be used as long term storage as well. At Sarjeant on the Quay the shrink wrap is partially removed allowing for the movement of air around the object, which helps to prevent off gassing from the crate materials as well as preventing damage which could be caused if the work was stored in a sealed crate. The support an open crate gives to the object also makes it more stable in the event of an earthquake. Because they are side-less, open crates allow gallery staff to easily monitor objects without having to open the side panels as you would with a sealed crate.